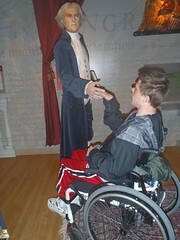 Wheelchair Travel Adventures: Madame Tussaud's Washington D.C. 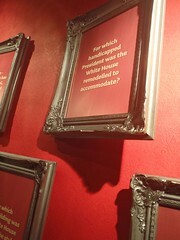 In my opinion Madame Tussaud's Washington D.C. is not worth the full price, but I have enjoyed going for reduced price twice. The first time was for like $5 when I went the day it opened and I lived in D.C. area. This time I got the tickets for $6 each from a Groupon deal. 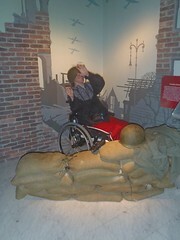 Getting into Madame Tussaud's is odd with a wheelchair, but the staff was friendly. 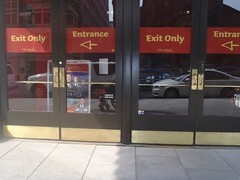 Note that the entrance to the main entrance/ticketing does not have an automatic door. After you get your tickets, you go back out the main entrance and then around the corner up to the second set of doors, which are actually the museum entrance. Staff let us in here, so the door was not a problem at this point. Then you take an elevator down to get to the museum and later back up to get out the way you came in. Madame Tussaud's D.C. is a lot of fun, especially if you are into the President's, as it has a wax figure for each U.S. President as the main attraction. It is cool that you can go up to them and take pictures with them. 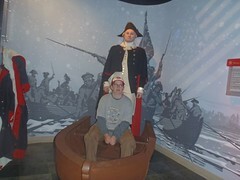 For the most part it is very accessible, too, although a few of the wax figures were hard or impossible for Mik to roll right up to, such as George Washington in the boat crossing the Delaware. Mik still enjoyed it all, though. Mik liked reading the facts about each President, although I did not like that they sometimes had certain props or settings for the Presidents and then did not explain the situation. For example, FDR is shown doing the fireside chats, but no explanation. Not that I really expect that much history info from this type of museum, though. The little interactive aspects were also fun. Mik got shackled up like a slave in the Civil War area. 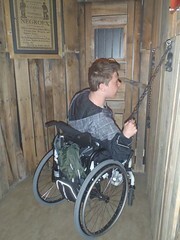 I made him do it to see if he could reach them in his wheelchair, but he found it interesting after he started doing it. 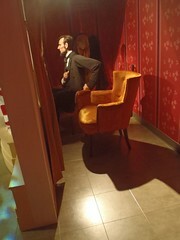 Unfortunately, in the same area he was foiled in wanting to take a picture next to Abraham Lincoln because there is a chair next to Lincoln for you to take a picture as if in the box with him at Ford's Theater, so did not really work out right in a wheelchair. It was also fun to flip the portraits to answer questions about what President was being described, however, Mik could not reach the top row. This was actually quite funny because the top row had one about what handicapped President was the White House remodeled for and a person in a wheelchair would not be able to flip it open to read more. I guess they just assume you should know if you are in a wheelchair. 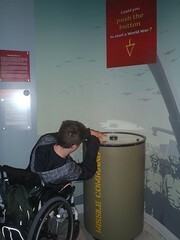 Mik's absolute favorite part was pushing the button in the war area that asked could you push the button to start a World War. It was hard for him to reach it and I did not think he would get it without my help stretching his arm out, but he was determined and after about five minutes he got it. The war area also included a sandbag area that I made Mik go into and wear the helmet. 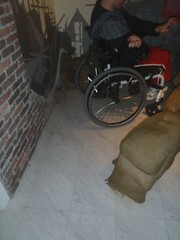 He did not like that part, but the wheelchair did fit in there. Mainly, he did not like the heavy helmet. Neither of us cared for the celebrity area, especially since we did not have a clue who most of them were and several did not seem to even have signs to tell you if you were clueless like us.